Some magazines have declared the winner when it comes to the presidential elections and some are still waiting for the public to decide. Others have decided on their dream team working together. Here is a quick snap shot of some magazines and the way they treated the Democrat and Republican candidates. For Rolling Stone there is no question about their choice (and no cover lines, as in what more can we say?) 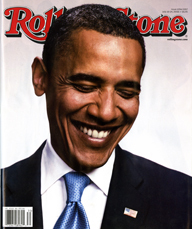 Barack Obama is the choice and for the first time in a long long time RS has a cover with no cover lines… (last that I can remember are the John Lennon and Yoko Ono cover in 1981, the Demi Moore cover in 1995, and George Harrison in 2002. As in the Obama cover, there was nothing but the name of the magazine, the date and the picture…not even a caption identifying the pictures. 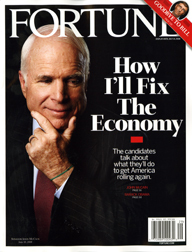 Fortune magazine on the other hand opted for giving the people the choice between the candidates. 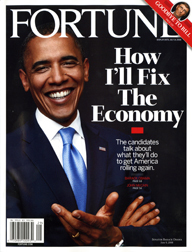 A split cover on newsstands offers readers the two candidates (each on his own cover) with the coverline How I’ll Fix The Economy. The editors at Fortune told min newsletter that they will let us know the result of the single copy vote at a later date. 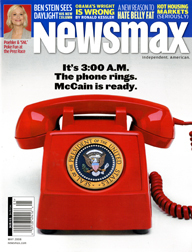 Newsmax magazine opted for the person who is ready when the Red Phone rings at 3:00 am. With the Red Phone being the big picture on the cover, the coverline informs readers that McCain is ready to take that call. BPA, along with about 10 other association and auditing bodies, including ABC, has ramped up a campaign to combat ad buying in un-audited titles. Called Buy Safe Media, the program targets client-side buyers in b-to-b markets that spend $250,000 or less on advertising. The program, initiated two years ago by BPA at the request of member publishers, has emerged from a testing and research phase and the 11 associations and auditing bodies have begun to reach out to their constituencies in earnest. The aforementioned quote is nothing but the intro to an article by Bill Mickey titled BPA and Friends Turn up Heat on Un-Audited Magazines… This so called campaign of Buy Safe Media tries to convince advertisers and ad agencies not to advertise in un-audited magazines (that is almost 6,500 consumer magazines alone out of the 7,000 plus on the market place). Both Bob Sacks and myself were horrified to say the least on how low some folks in our industry are willing to sink in order to make their business flourish. Unknown to them, or so it seems, is with their action they maybe bringing the temple on their competitors and themselves at the same time. 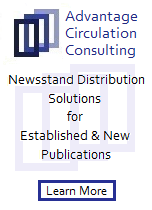 It is needless to say that people who are willing to advertise in a magazine that gives you 52 issues for $10.00 because it is audited, but not in a magazine that will charge you the same price for one issue but is not audited, are not in the business of customers who count, but rather they are in the business of counting customers…customers in most cases who do not count. The new pathology detailed below actually disgusts me. 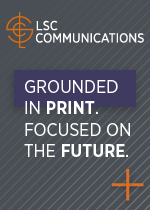 There are over 18,000 magazines printed today and of that number 7,000 are newsstand titles. 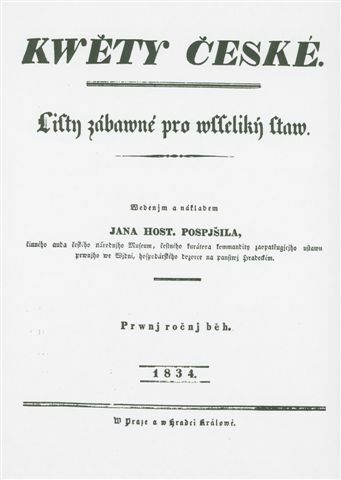 There are approximately 1,000 new titles started each year. This report and the campaign against legitimate magazines listed below is an attack at the heart of the entrepreneurial publishing business. ABC, ABM, BPA, and the Association of National Advertisers have a very minor fraction of the titles published in their bullpen, yet they wish to crush all who stand in their way or choose not join their exclusive clubs.
. . . it is about time for magazines to start looking at customers who count and not just counting customers . . . those folks who publish great magazines like Good and Flaunt do not need an auditor to tell them how many people are receiving their magazine. 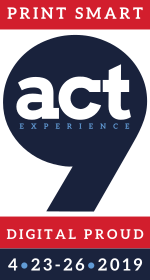 Their customers, both the advertisers and the readers know the relationship that they enjoy between the reader and the magazine . . . It is a pure case of jealousy and greed to launch such a campaign. When are we going to learn not to attack each other and focus on other media. Advertisers who want to reach that unique upscale audience of V magazine are not interested to see either the ABC audit or the BPA audit . . . When are we going to learn . . . I have no earthly idea . . . It is unconscionable to attempt to crush the rest of the industry. It is attacks and stupidity like this that will tear down the very industry that they are attempting to prop up with self-serving dogma. Like chastity, auditing is/and should be a choice. A pox on all your houses; but I cannot wish harm on my industry by wishing that ye reap what ye sow. The news about U.S. News & World Report cutting its frequency next year to 26 times a year brought the prophets of doom and gloom from their hideaways to spread yet another prophecy of “Print is Dead” and “We told you so.” The funny thing is those folks have such short memories and can’t seem to recall their own predictions in 1985 about the end of the newsweeklies because of a thing called CNN, and later because of another thing called the internet. A quick look at the content of U.S. News & World Report shows that neither the U.S. News or the World Reports are there, in force, anymore…it feels that the great DNA of the two combined magazines of days past has disappeared. Maybe a better name for the new product should be U.S. Consumer & Reports since, after all, it seems like what they are trying to do is, in fact, create another Consumer Reports magazine, but this time one that is published every other week. It is a sad day for a magazine that once was considered the “academic” of all news weeklies to exit the weekly scene completely, but it is a sadder day when we butcher a DNA and put the blame on something else. Killing the magazine and starting a new one with a new name U.S. Reports will be much more appreciated from both the traditional readers of the magazine and those who may pick up the magazine under the new name. 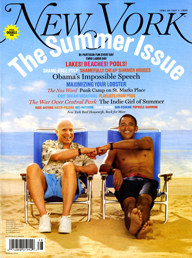 You are currently browsing the Mr. Magazine blog archives for June, 2008.